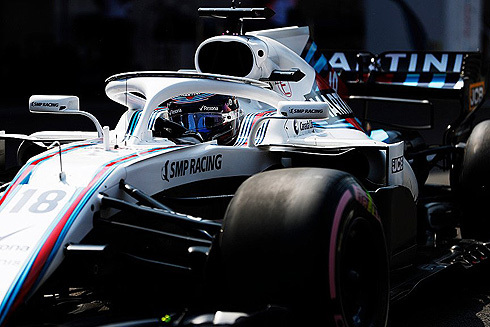 The opening Friday practice for the 2018 Mexican GP would see the Williams Martini team finish in 18th and 19th with Sergey Sirotkin leading team-mate Lance Stroll. It was a porductive session for the team as they worked through their program. Again they still suffered the frustrations of lacking in performance as well as having to cope with issues with degredation of their hypersoft tyres. With hypersofts, ultrasofts and supersofts tyres available from Pirelli the opening Friday practice session for the 2018 Mexican GP would get underway. Apart from the Mercedes drivers everyone had completed their installation laps. The first times would be set with Vettel quickest with a 1m:19.696 followed by Raikkonen with both on the hypersoft tyre. Perez would move up to third followed by Vandoorne, Sergey, Grosjean and Magnussen. Sainz would go quickest with a 1m:19.523 on what was still a very dirty track. Perez was now fastest with a 1m:19.469 while Hulkenberg was now fifth. It was changing quickly as Verstappen went fastest with a 1m:18.588 followed by Ricciardo and Bottas third. All these times were set on the hypersoft tyre. But it was now Hamilton quickest with a 1m:18.268. Verstappen would again be quickest with a 1m:18.026 but Ricciardo would move ahead with a 1m:17.932. After the first series of times were set the Williams drivers would find themselves down in 14th and 17th with Lance leading Sergey. The top ten was Ricciardo from Verstappen, Hamilton, Bottas, Sainz, Perez, Vettel, Raikkonen, Hulkenberg, and Giovinazzi in the Sauber tenth. 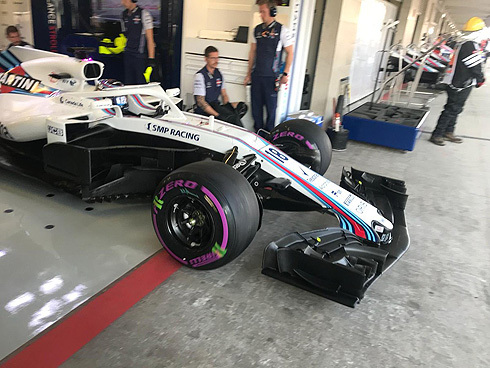 With forty minutes of the session completed the track would empty as drivers returned to the pits to return their first set of Pirelli tyres. Only four drivers had used the ultrasoft tyre for their runs. With thirty five minutes remaining drivers would start to return with more now running the ultrasoft tyre. Hartley was now fifth and Grosjean ninth with both running on the hypersoft tyre. At the front it would be Verstappen who was now quickest with a 1m"16.656 followed by Ricciardo, Sainz, Hulkenberg, Hamilton, Vettel, Bottas, Raikkonen, Hartley and Perez tenth. With twenty minutes remaining the Williams drivers were 18th and 19th. Both would return for a further run on the hypersoft tyre no doubt to gather more data. Lance would come out for his first run using the ultrasoft tyre. Lance would pit after a two lap run. Lance was out running on the hypersoft tyre and would set a 1m:35.605 to currently be tenth. Lance would improve with a 1m:21.710 to be eighth. With a 1m:21.135 Lance was now 12th with an hour remaining. He would drop to 14th and would pit briefly having completed an eight lap run. He would complete one extra lap before pitting. Lance was now back out with just over thirty minutes remaining again on the hypersoft tyre currently 18th. He would set a 1m:20.359 to remain 18th. A 1m:20.142 would see Lance still 18th. Lance would pit after a five lap run. With fifteen minutes remaining Lance was back out on used hypersoft tyres. He would pit having said that the rears were shot having completed fourteen laps on the hypersoft tyre in total. 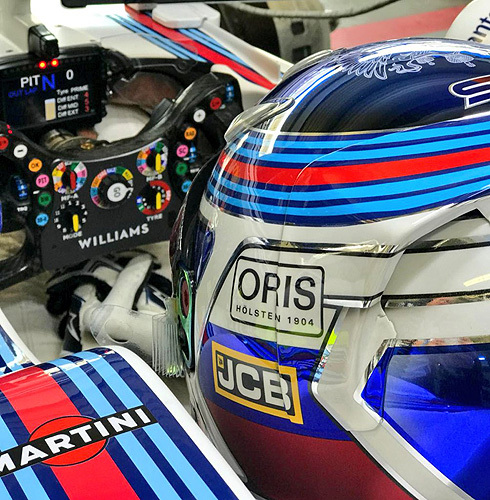 Sergey would be first out for Williams in the opening Friday practice running on the supersoft tyre. Sergey would pit after a two lap run. Sergey would return running on the hypersoft tyre with just under an hour and ten minutes remaining. Sergey's fist timed lap was a slow 1m:39.329 to currently be fourth. He would improve with a 1m:22.236 remaining fourth. He would drop to eighth then 11th. He would drop down to 17th with under an hour remaining. Serge would also pit after a ten lap run. Sergey would return running on a new set of ultrasoft tyres. He was currently 19th but his first lap would see a 1m:19.899 to now be 16th. He would drop to 18th. Sergey would pit after a seven lap run. Sergey would also return running on used hypersoft tyres.